'Only when the two come together, inner and outer authority, do we have true spiritual wisdom. We have for too long insisted on outer authority alone, without any teaching of prayer, inner journey and maturing consciousness. The results for the world and for religion have been disastrous ...I offer these reflections to again unite what should never have been separated: sacred Scripture and Christian spirituality.' From The IntroductionIn this exploration of central themes of Scripture, Richard Rohr transforms the written word, discovering in these ancient texts a new and vital meaning, relevant and essential for modern Christians. He uncovers what the Bible says about morality, power, wisdom and the generosity of God in a manner that demands a life-changing response from believers. Rohr offers his readers a Christian vision of abundance, grace and joy to counteract a world filled with scarcity, judgement and fear-a vision that can revolutionize how we relate to ourselves, others and the world. 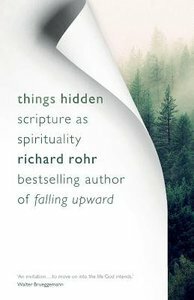 About "Things Hidden: Scripture as Spirituality"